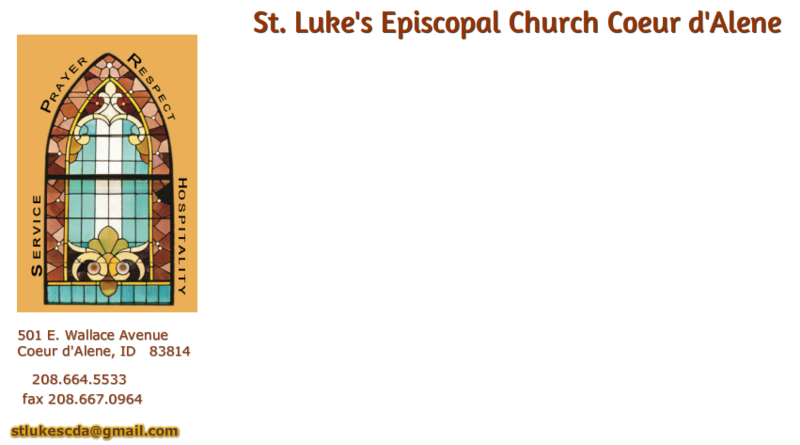 Below are a few of the offerings and opportunities available at St. Luke’s. All programs are open to parishioners at St. Luke’s, as well as to the community. Our education and spiritual formation ministry is growing. If you have thoughts or ideas on what programs or offerings you would like to see, we would like to hear your thoughts. A five week course to discover more about the Episcopal church, especially but not limited to those who wish to be received/confirmed. It will be led by Fr. David and Glenda and will run for five weeks beginning March 10. The class is help in the Alison Library from 11:45—1. The program will involve short video clips and discussion while enjoying a light soup, salad, bread supper. Tuesdays March 19, 26 and April 2. Sign up sheets are on the bulletin board in the Parish Hall. Lead by The Rev. Glenda Empsall. We Make the Road by Walking has 52 readings that explore growing in faith with each other and in our world. The readings give an overview of the Bible, and will guide the group through a year of rich study and interactive learning. Read more information here. A new contemplative prayer services has started on the Monday's at 5 p.m, meeting in the sanctuary. The first Monday of each month the service includes a labyrinth walk with a canvas labyrinth set up on the Parish Hall. Classes meet on Thursdays at 4:30 p.m. in the Alison Library. St. Luke’s offers two services on Sunday mornings for families with children: The Well which is designed for families with younger children; and The Jordan, which is designed for families with school-age children (readers through middle school). These services combine Christian education (aka Sunday School) with our Episcopal liturgy in a child-friendly atmosphere. During the school year from September through May, The Well (9:15 AM) and The Jordan (9:00 AM) start out as separate services, providing age-appropriate interactions. During the summer months, these two services are combined and begin at 9:15 AM. At The Well, everyone plays instruments, sings and hears stories. In The Jordan service, families participate in a modified version of the Rite II liturgy, helping the children to connect bible passages to their own lives and teaching them about the Gospel by reading, drawing and acting out the weekly stories. The Jordan and The Well services combine for Eucharist and the closing portions of the liturgy. A major aspect of these services is that the children, regardless of age, take an active role; reading, collecting the offerings, setting the table and assisting with many aspects of the Eucharist. Youth who attend our parish are active in service participation and are involved in Diocesan youth activities and summer camps at Camp Cross, the Diocese of Spokane’s retreat/camp ministry on Lake Coeur d’Alene. Throughout the year we offer orientation classes to introduce parishioners to the Episcopal Church and worship. Information on class formation is listed in the weekly Let’s Connect and in our monthly Newsletter. Bible (Old and New Testaments) and book studies, as well as other spiritual informational classes, are offered throughout the year. For example, this past year during Lent, we offered several sessions to learn more about Judaism and Islam from practitioners of these Abrahamic faiths. These sessions are led by both clergy and lay. Check back to this page or Keep an eye on Let’s Connect and our monthly Newsletter to find out when new classes or offerings are forming. Education for Ministry is a four-year program offered through the University of the South’s School of Theology for those who would like to better understand the history of the Judeo-Christian faith, the surroundings that helped shaped it and how the church and society have influenced each other over time. As a student of EfM, you’ll learn methods of more fully incorporating your faith into your everyday life. The program imparts knowledge and confidence to your personal ministry, perhaps helping you to discover your call to service in the church and in the community. St. Luke’s EfM is a “one room schoolhouse” where, in tandem, first year participants study the Old Testament, second year participants study the New Testament, third year participants study Church History and fourth year participants learn about 20th century theologians and philosophers. As fourth year participants graduate and new first year participants are welcomed aboard, the group is renewed and refreshed. This is not a traditional “Bible Study” nor is it a lecture series. EfM is a safe place to discuss individual beliefs and to expand understanding of the Christian faith. There are no prerequisites. Reduced-rate tuition and partial scholarships are available. While it takes four years to complete, your commitment to EfM is given one year at a time. Let us know if you are interested in learning more about joining EfM. St Luke’s has a library of spiritual books available to borrow, which can be found in The Alison Library. The books may be borrowed on the honor system and returned after you have read them. If you are looking for a specific book, there is a red three-ring binder which sorts the library by author and by title. Books are filed using the Dewy Decimal system. Once you have located the book you want on the list, refer to the column headed “Dewey” to identify stack location. When you bring the book back simply put the book on the shelf area marked BOOK RETURNS. Our volunteer church librarian will return them to the stacks. Space is limited so contact the office to ask before making a book donation.